The fiery church bus crash this week on I-40 in Tennessee brings to the forefront the issue of bus safety, and the vulnerability of persons traveling in buses – whether private or chartered commercial vehicles. The Tennessee crash involved a church bus from Statesville, N.C., headed home with a senior adult group which had been to a gospel jubilee in Gatlinburg. Early reports are that the front left tire on the bus blew out, sending the bus across the median and into oncoming traffic, where it collided with a Chevy Tahoe and a tractor-trailer. Eight people died and 14 were injured in the crash. Motor coach investigators, post-crash investigators and accident reconstructionists will be working to process the accident scene. The National Transportation Safety Board, which investigates mass transportation wrecks, has been alerted to the crash, according to the Tennessee Emergency Management Agency. Maj. John Albertson of the Tennessee Department of Safety and Homeland Security told the Knoxville News Sentinel, “It’s a very complete, detailed investigation.” You can be sure that details and answers to many questions will be forthcoming over the next few weeks. But you may have some of the same questions we did: What regulations govern church buses? What safety precautions should be in place? What are the options now for the bus crash survivors and the families who lost loved ones? 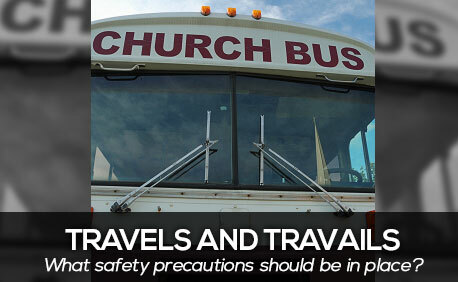 Churches that use buses or large vans to transport passengers across state lines may be subject to federal safety regulations for motor coaches and buses. If the organization provides interstate transportation of passengers in a vehicle designed to transport more than 15 passengers (including the driver) or which weighs more than 10,000 pounds, it falls within the definition of a “private motor carrier of passengers” (PMCP) and is subject to regulations of the Federal Motor Carrier Safety Administration. A church bus which does not cross state lines is not subject to federal regulation but may be subject to similar state regulations. Among the federal regulations applicable to PMCPs are those mandating that the bus driver have a commercial driver’s license and meet a number of driver qualification requirements; that the vehicle meet certain parts and accessories requirements; and that the vehicle is subject to inspection, repair and maintenance requirements. An FMCSA brochure regarding the Regulations for Private Motor Carriers of Passengers is available here. Perhaps your church uses a smaller vehicle to transport members only around town. In that case, it is not subject to the federal regulations but still must comply with state laws. But lest you think that vans are safer than buses, you should be aware of the “van vs. bus controversy.” Because 15-passenger vans have been found to be subject to roll-overs, some church governing bodies are recommending that their churches rid themselves of these vehicles. The South Carolina Baptist Convention, for example, suggests that its churches (1) sell all 15-passenger vans; (2) purchase a mini-bus with school bus rating standards and use CDL drivers where applicable; and (3) use commercial bus companies when sponsoring out-of-state trips or for groups of 20 or more. In the spring of 2012, the National Highway Traffic Safety Association issued a Consumer Advisory about 15-passenger vans. You can read it here. Specifically mentioned in the NHTSA advisory is the importance of tire maintenance; it is paramount to preventing rollover crashes and other accidents. They warn users of 15-passenger vans, such as church groups, to use appropriately-sized tires and check them for proper inflation before every trip. Tires can degrade over time, even if they do not have a lot of mileage on them, so spare tires should not be used as replacements for worn tires. In fact, the NHTSA echoed the warning of most tire manufacturers — tires older than 10 years should not be used at all. For people injured in bus accidents, life will never be the same. They may have serious injuries, and most likely will have suffered emotional trauma. As in the I-40 crash, there may be families who will forever miss their loved ones whose lives were lost in the catastrophe. Nothing can undo what has been done. But in some cases a personal injury attorney can improve the situation by seeking damages from the motor carrier, the insurance company, the driver, or even the sponsoring organization. People injured in a bus accident may be awarded damages for pain and suffering, medical expenses, lost wages and earning capacity, scarring or disfigurement, and loss of enjoyment of life. Family members of those fatally injured may be compensated through a wrongful death claim. At the Louthian Law Firm, we have been securing justice for injured people for more than 80 years. When life goes wrong . . . as it did this week for members of the Front Street Baptist Church . . . we fight for what’s right.